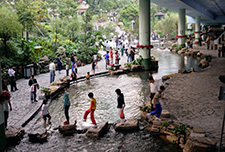 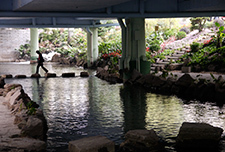 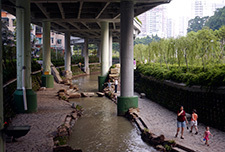 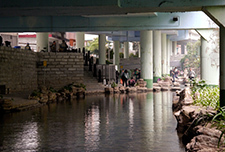 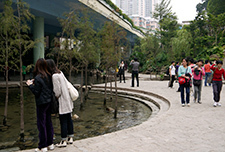 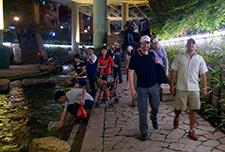 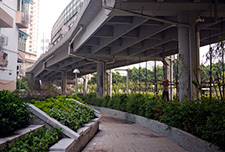 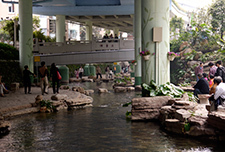 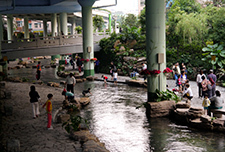 As part of the city’s greenways project, the Donghaochong canal was also restored. 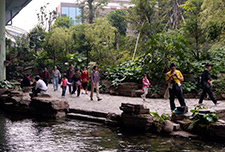 Of the 3 ancient canals that brought water from the Baiyun Mountains to Guangzhou since the Song Dynasty, only the Donghaochong was never buried. 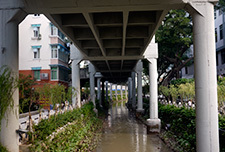 Until recently, it was a polluted ditch running mostly under an elevated expressway and uncontrolled urban development had encroached on the banks of the canal, spilling sewage sometimes into adjacent residential and commercial properties. 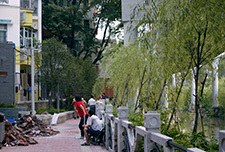 Periodically, the buildings were flooded when waters overflowed the banks of the canal. 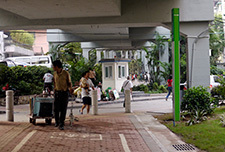 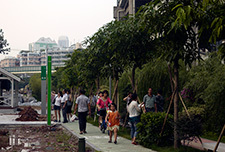 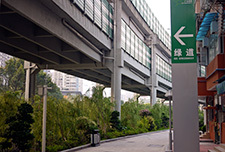 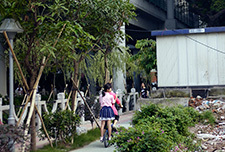 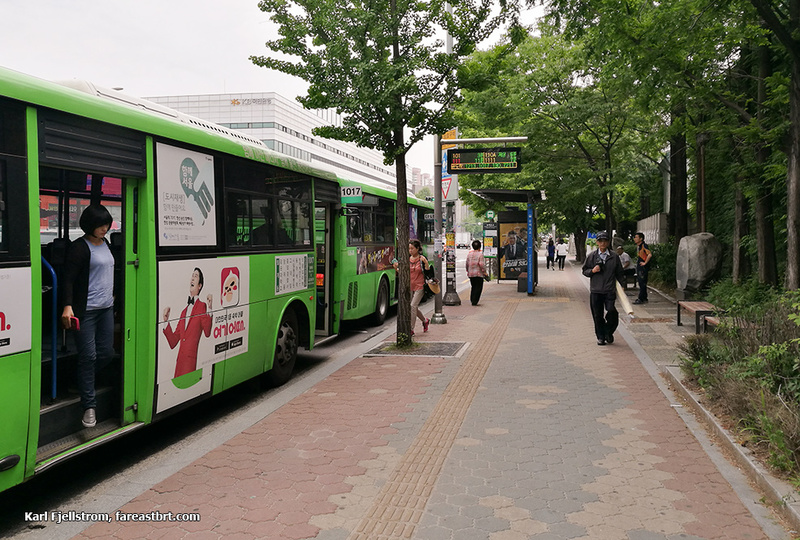 Starting in 2009, over 7 hectares of land along the Donghaochong were cleared and turned into a greenway, with world class walking and cycling facilities (walk, cycle). 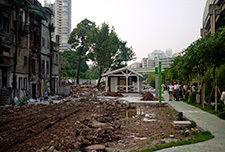 Over 1000 families had to be resettled and over 48,000 m2 of commercial real estate cleared for this restoration. 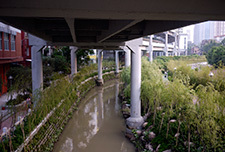 The sewers had to be connected to sewer pipes and the entire canal dredged and cleaned. 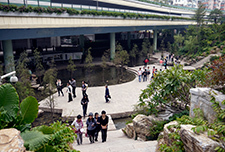 Ten new bridges across the canal were built, 5.4 km of new pedestrian walkways, 1.3 km of new bike paths, and 3.2 km of new road works make up the first phase of development. 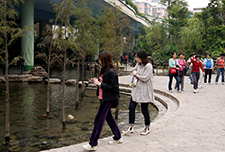 In the surrounding area over 329,000 m2 of new commercial real estate were developed. 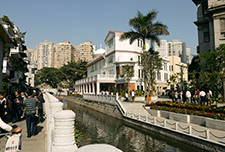 The Donghaochong canal museum, housed in two historic villas, opened to provide more information on the place and its history. 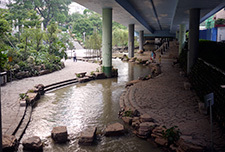 Click here for more photos of the Donghaochong canal and greenway. 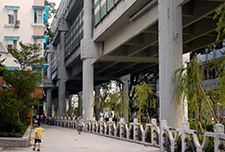 Donghaochong before the improvements (above), and after (below). 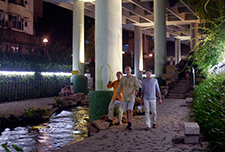 Most of the greenway is located along the canal, but the northern section passes through a dense community, providing popular new public spaces for residents.